【Superlative 360° Stereo recording &Intelligent Noise Cut】High sensitivity and less noise with 1536kbps voice resolution,built-in dual microphone system, the audio recorder enhances human speech for a much clearer audible range, and reduces distracting background noise. 【POWERFUL FEATURES】8GB internal memory let you store up to 576 hours of recordings or 1500 songs. Built-in 510mAh rechargeable battery can record continuously for 23 hours. A-B repeat, fast forward and rewind during playback. Automatically save when accidentally shutdown or low power, no more missing valuable recordings. Also doubles as a Hi-Fi MP3 music player. 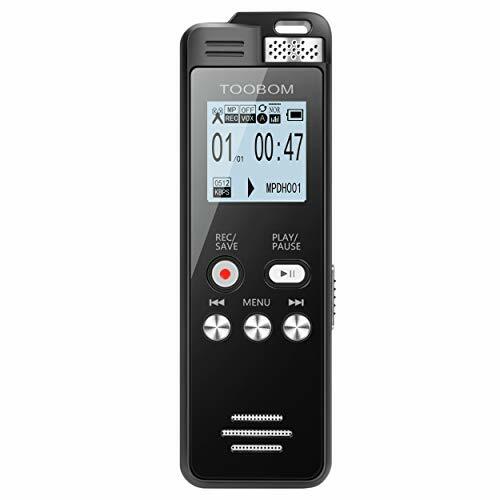 【Voice Activated Recorder】The portable voice recorder will automatically start recording once sound is detected. No more silent snippets or whispers muddying your recordings. You will save both space and time with this recording device. 【STURDY, SLEEK & CONVENIENT】Alloy body with tempered glass back & clearer OLED screen, compact, lightweight, elegant and sturdy, conveniently fits in your hands, pocket or briefcase to take anywhere. Simply one switch to record & save, perfect for recording lectures, classes, meetings, group talking, interviews or your daily life. 【Mac Compatible & 1 Year Warranty:】 Save recordings with file names and time stamps. Easy to manage and transfer files to Mac or Windows PC via USB. It is extremely simple. 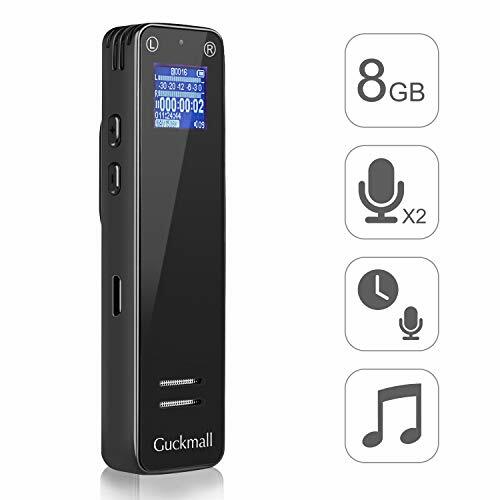 Each of Guckmall pocket sound recorders are checked by an outstanding quality assurance system. If you are not 100％ satisfied with our mini voice recorder or have any concerns，please feel free to contact us(email address: Su206Su56style@outlook.com) for a FREE replacement or FULL refund. 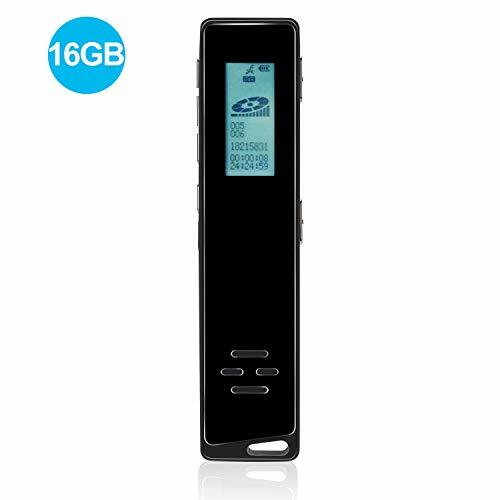 ☎ 【1536kbps Professional Voice Recorder】 Built-in 8GB internal memory can store up to 580 hrs audio files OR 1500 songs, expand to 72GB via a Micro-TF card. Supports WAV/MP3 formats, can be used as an MP3 player or flash drive. Built-in Dual multi-directional microphones for capturing a full and detailed stereo sound, supports a long distance recording. ☎ 【Easily Use with One Touch Recording Design】 Press REC/SAVE button to start/save recording, backlit LCD display screen with a friendly user interface intuitives to setup which provides you with a simple operation. Utilizes Noise Reduction Technology to enhance human speech recording and filter out background noise, achieves stereo HD recording. ☎ 【Sensor Voice Activated Recorder】 Activates the recorder only when an audible sound is detected, conserving space and eliminating soundless passages. A-B repeat/fast forward & rewind during playback allows you to listen to your desired part easily and quickly. 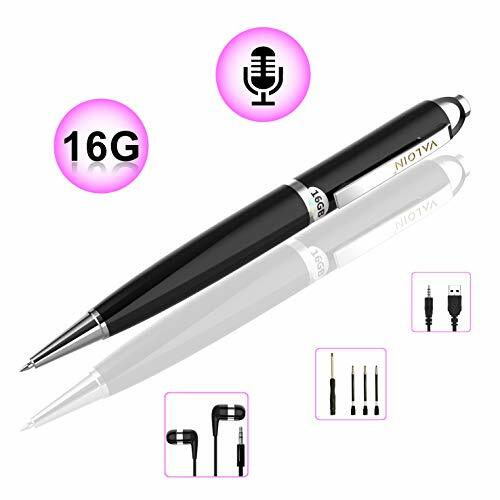 ☎ 【Enjoy a RISK-FREE purchase】 Good for recording your ideas, memos, lectures, meetings, interviews, etc. It is an useful gift for students, professors, teachers, businessman, lawyers, writers, blogger, journalist. Buy it now with 18-month warranty from the date of purchase!! VOICE ACTIVATED RECORDER AND PASSWORD PROTECTED: R.DYNASTY voice recorder can detected the voice automatically, set the AVR voice activated function, records only when voice detected, reduce blank and whispering snippet, save space and time. A 4 digits password can be added on the 16GB built-in memory so that nobody can access your recordings. When the battery is low, the system will automatically save the recording files and power off, make sure the files in safe status. NOISE CANCELLING AND CRYSTAL CLEAR RECORDING: New design digital voice recorder, dynamic noise cancellation microphone, this audio recorder boasts a sophisticated all directional mic records the best quality sound. With our unique automatic acoustic noise reduction feature and a 1536kbps voice resolution, enjoy crystal clear recordings whenever you use this recorder. Adjust the volume up to 80DB so that is loud enough for you. ULTRA SMALL DIMENSIONS AND PLAYBACK FUNCTION: Mini tape recorder that you can take it with you everywhere, work 24 hours for each charging, built-in 16GB memory could hold up to 576 hours of recording(when setting at 64 kpbs recording quality). Newly added auto record, set it and forget it, automatically recording at scheduled start time, end time, and could set repeat at once. Long press the "up" or "down' to play back immediately without attaching it to a computer or mobile phone. 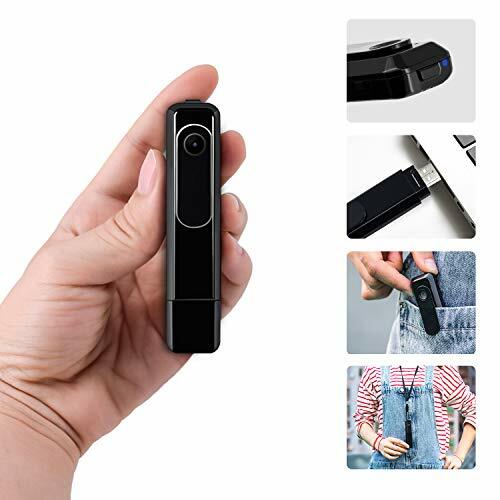 【CONVENIENT IN MANY OCCASIONS 】: this recorder is measured 3.27in x 1.38in x 0.47in, easy to fit your pocket or wallet to carry around, powered with rechargeable battery. It can be used to record meetings, conferences, lectures, interviews and so on! 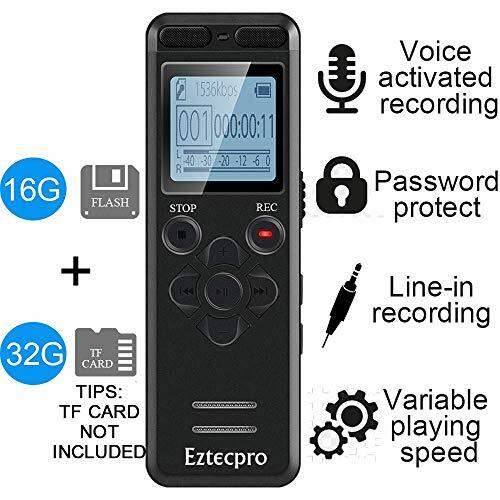 【EASY OPERATION&VOICE ACTIVATED】:One-Click Recording Make it easy to Operate the Recorder--- being convenient for you to record waht you want in any time and any where.Voice activated control function make it more easy to record with your hand free. 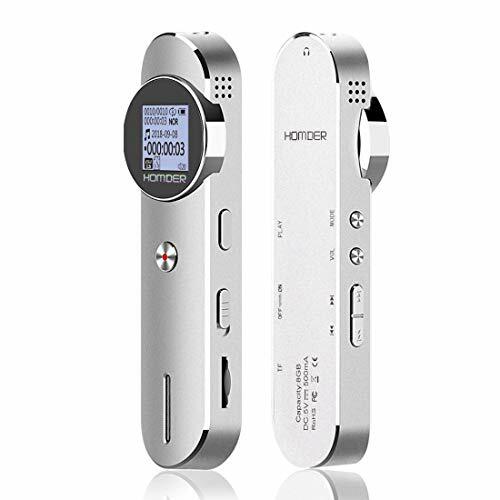 【GET A DOUBLE ADVANTAGE】This recorder is not only a dictaphone to record your voice, but also a MP3 player for you to listen to music. We make our products with highest quality. If you have any questions and comments, please contact us. We guarantee your satisfaction! OUTSTANDING AUDIO QUALITY. Comes with 2 high-fidelity microphones, the voice recorder reduces background noise, records lecture, meeting, conversation and personal notes at up to 1536kbps in WAV and 192kbps in MP3, delivers crystal clear playback for you to easily review and transcribe. MULTI-RECORDING MODE. One-touch operation in normal recording. Timed recording will auto turn it on, record and save the file. Voice activated recording it omits silent period and records voices only to save storage space. Set it and forget it. Capture what you want. ENORMOUS INTERNAL MEMORY. 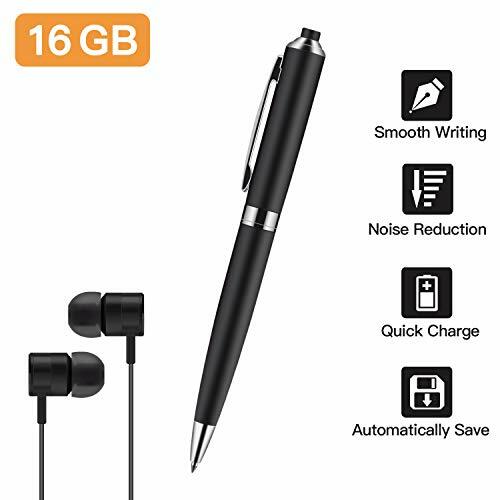 Comes with 8GB memory, enough space for 500+ hours of recording recorded at 32kbps in MP3 and 12 hours recorded at 1536kbps in WAV or 1500 songs. It can be used as a convenient way to store, back up, share files and as an MP3 player. EASILY RUN IN WINDOWS / MAC OS. No need of additional drive, plug and play on PC, MAC, laptop for easy file access. The sound recorder saves file in WAV or MP3 format, allowing to playback virtually anywhere. Record on the run, when back to desk, just plug and share with others. EXTRA LONG BATTERY LIFE. The 340mAh rechargeable Li-polymer battery guarantees 15 hours of recording on one charge, ensuring your recorder will always be ready to work when you are. A must have when phone is not allowed or may run out of battery. ONE YEAR WARRANTY. HIGH FIDELITY RECORDING QUALITY: 1536Kbps high quality PCM Recording with the high-sensitivity microphone, this digital voice recorder can bring you crystal clear recordings. It is suitable for a variety of occasions, such as lectures, meetings, interviews or speech and so on. VOICE ACTIVATED CONTROL: When the AVR mode is on, this audio recorder is able to automatically record the voice that is loud enough and stop recording when the voice stops. You can adjust the voice recorder within 5 AVR levels, to record the most important content you need. RECORD SUBSECTION & TIME MARK: With record subsection function, 30/60/120min recording subsections can be automatically separated from a long recording to save as several independent files. With time mark function, the start and stop points of a certain recording section can be marked out during recording. You can easily replay a specific section by skipping to the marked point. 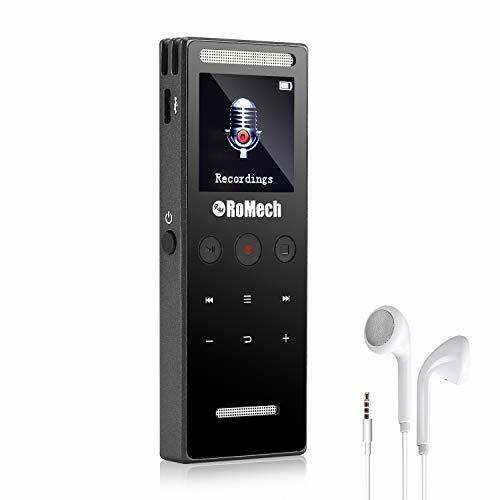 METAL HOUSING & LARGE STORAGE: High-quality and light-weight Aluminum Alloy material body as well as 8GB build-in flash memory capacity, which makes this device undoubtedly a durable, portable and reliable sound recorder. EXCELLENT LOSSLESS MUSIC PLAYER: It's not only a professional digital recorder for lectures, but also a superior lossless music player with the function of playing FLAC/APE as well as MP3 files, by connecting your computer to download files to this device. 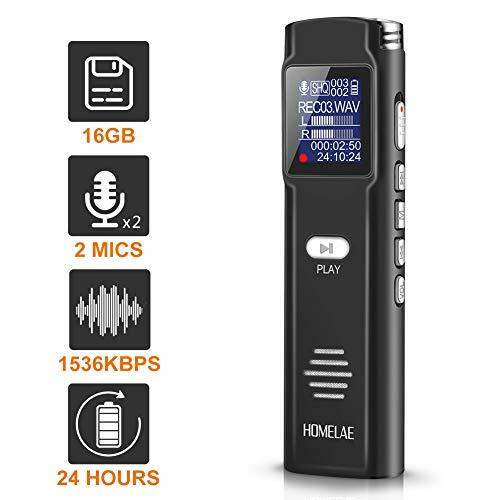 ➠HIGH FIDELITY RECORDING QUALITY: 1536Kbps high quality PCM Recording with the high-sensitivity microphone, this digital voice recorder can bring you crystal clear recordings. It is suitable for a variety of occasions, such as lectures, meetings, interviews or speech and so on. ➠VOICE ACTIVATED CONTROL: When the AVR mode is on, this audio recorder is able to automatically record the voice that is loud enough and stop recording when the voice stops. You can adjust the voice recorder within 5 AVR levels, to record the most important content you need. ➠RECORD SUBSECTION & TIME MARK: With record subsection function, 30/60/120min recording subsections can be automatically separated from a long recording to save as several independent files. With time mark function, the start and stop points of a certain recording section can be marked out during recording. You can easily replay a specific section by skipping to the marked point. 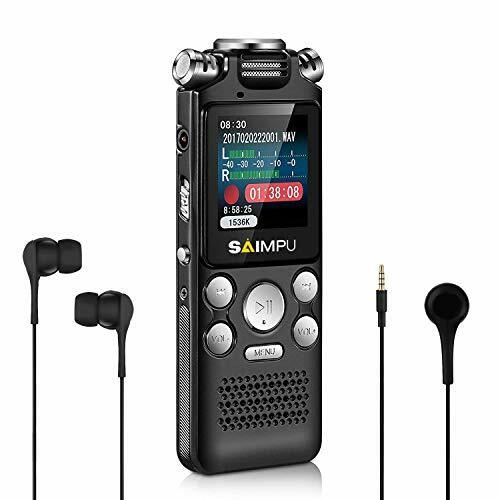 ➠METAL HOUSING & LARGE STORAGE: High-quality and light-weight Aluminum Alloy material body as well as 8GB build-in flash memory capacity, which makes this device undoubtedly a durable, portable and reliable sound recorder. ➠EXCELLENT LOSSLESS MUSIC PLAYER: It's not only a professional digital recorder for lectures, but also a superior lossless music player with the function of playing FLAC/APE as well as MP3 files, by connecting your computer to download files to this device. 【 Professional Noise Reduction & MP3 player 】_ professional intelligent digital noise reduction chip, supports MP3, WAV, ACT recording format. 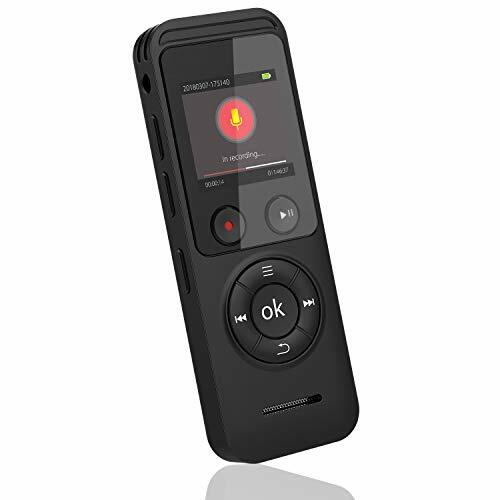 This mini voice recorder is also a MP3 player, you could enjoy the music after your tired study, meeting. 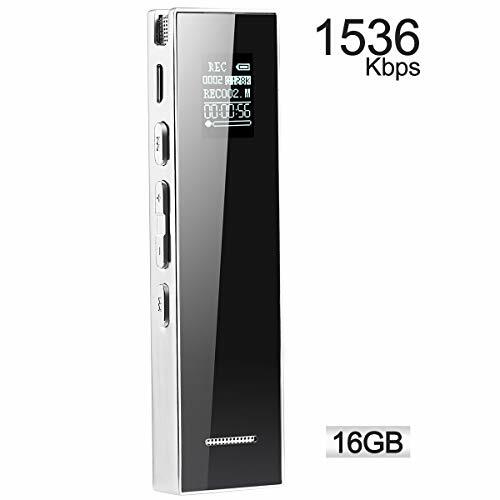 【 Large Capacity Storage & Long-time Continuous Recording 】_ Built in 8GB memory, the bit rate is up to 1536kbps; Built-in 3.7V / 500mA lithium battery, recording time 1536KBPS about 12h, 128KBPS about 96h. Charges via Micro USB2.0 port. 【 Timer Recording & One Button Recording 】_ Accurate time control recording, in a power-on state, one button record / save important moments; and the color display make the interface more intuitive and rich, giving you a brighter experience. 【 Voice activated recording 】_ Built-in 2 HD sensitive microphone, automatic voice reduction function, it starts recording when sound is detected or turn to standby state, saving recording time and reduce power consumption. 【 Easily Transfer Files to PC 】_ just connect the recorder to your computer using the supplied USB cable and drag the files over to your PC. It is really that simple! Please note: The song in the machine is the test song that come with the system. It does not mean that the machine has been used. ※1.DUAL-CORE PROCESSOR NOISE REDUCTION: Using professional DSP acoustic processor,built-in intelligent noise reduction chip,directly filter the surrounding noise,abilitiy to capture recording content accurately and clearly. ※2.THREE ULTRA-SENSITIVE MICROPHONES: Great voice recorder for lectures,conferences,interviews,classes,conversations and concerts with ultra-sensitive microphones.The maximum sound sampling rate is 1536Kbps and supports recording distances up to 50 meters. ※3.VOICE-ACTIVATED RECORDING: The recording can be activated by sound,the silent segment can be omitted to save the storage space.You can use the earphone to listen to your sound while recording,the recorder function simultaneously as a hearing aid. 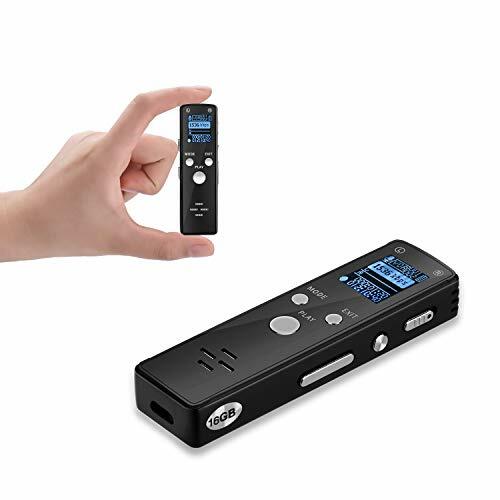 ※4.POWERFUL AND EASY TO OPERATE: Our digital recorder supports both MP3 and WAV format file which can be easily transferred to MAC or PC;recording files saved with time stamp;one switch to record,save and delete.Audio recorder has metal solid case,lightweight and it is portable. ※5.EXCELLENT AFTER-SALES SERVICE: SAIMPU provides lifetime warranty with professional customer service support. (Service card comes with your package.) (WARNING: Does not fit for recording with external microphone). 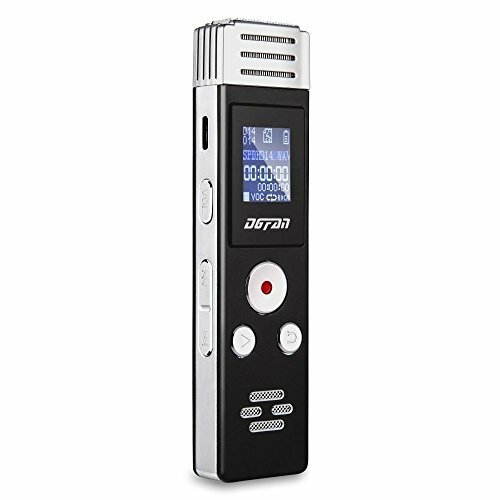 ❤【Super Clear Audio】With DSP noise reduction technology, this Digital Voice Recorder can record from a distance over 40 feet. You can enjoy up to 1536Kbps flawless recording quality at daily conversations, public speeches, school lectures, office meetings, audio memos and more! 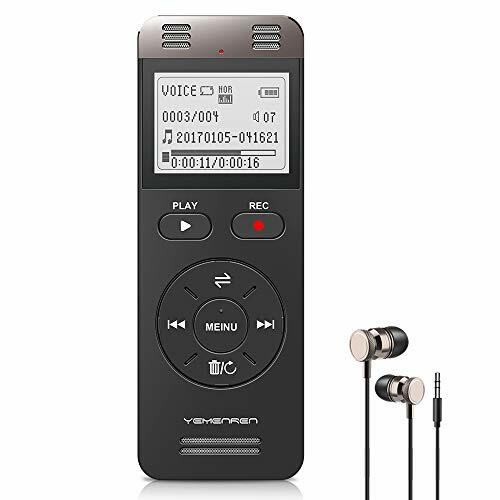 ❤【Voice Activated&A B Repeating】The recorder can automatically start recording when sound is detected which helps you save lots of memory space.Supports A-B playback recording, Variable playing speed (8 different speed level, accelerate and decelerate). ❤【U Disk & MP3 Player】This dictaphone can be used as MP3 and USB flash drive. Comes with USB cable, it is compatible with Apple or Microsoft devices. 8GB internal memory let you store up to 564 hours of recordings (record at 32kbps). ❤【Worry-Free Warranty】Comes with 1*voice recorder, 1 pair* earphones, 1* user manual, 1*usb cable. Besides, we provided you one year worry-free warranty. If you have any questions, please feel free to contact us. 【Supreme Sound Quality】-- Up to 1536kbps bit rates and professional dynamic noise reduction bring you perfect auditory enjoyment. Dual extra-sensitive microphones and 7 adjustable sensitivity levels allow high-fidelity recording in 50ft. 【High-speed USB】-- Matching Windows/Mac OS through 2.0 USB interface. 8GB memory is capable for up to 576 hrs recording or 1,500 songs. Expandable 32GB memory involves all types of files as a memory stick. 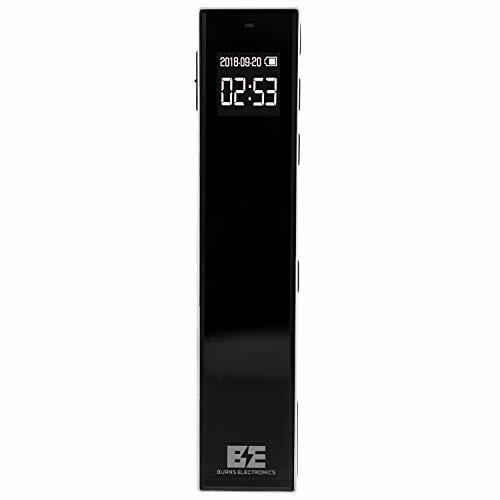 【Optimal Battery Life】-- Enjoy up to 24 hours of recording after 2-hour fast charging. Powerful speakers of this sound recorder liberate ears from headphones. Excellent codec supports music in MP3/WMA/WAV/APE/FLAC formats. 【HD OLED Screen】-- Lighter and thinner OLED screen of the tape recorder suits for indoor and outdoor use, and saves more energy. Voice activated mode, A-B repeat and adjustable playback speed enhance efficiency of work. 【Music Without Limits】-- This audio recorder perfectly supports lossless music formats as a professional MP3 player. The Hi-Res sound quality is as pure as gold. Alloy frame produces a portable case that houses the best quality inside. 【Super Long Recording Time】 Built-in high capacity rechargeable battery, 8GB memory allows you store up to 700 HOURS of recordings without the need for additional memory cards. And you can also use the huge internal memory capacity to store any other type of data files. 【Crystal and Clear Sound Quality】 The Digital Recorder built-in 2 ultra sensitive microphones and easy to capture every single note at up to 1536KBPs, giving you crystal clear recording output. Perfect for interviews, meetings, lectures, record sermons at church and etc. 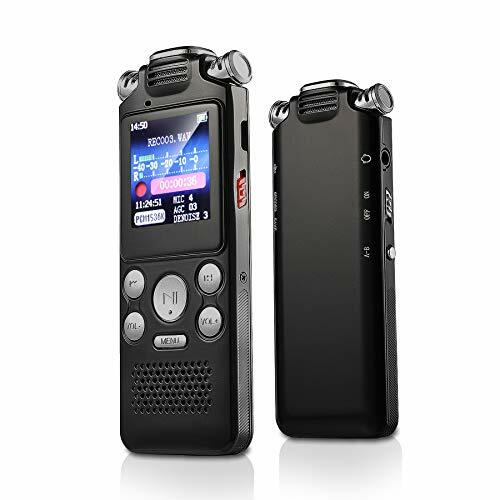 【One Key to Record, Easy to Use】 This Dictaphone comes with a high-quality LCD screen that makes using it fast and easy. Transfer files is very simple, Just connect the recorder to your computer using the supplied USB cable and drag the files over to your PC. Built-in a button "Rec" which allows you fast begin your recording, no need extra operation, so easy! 【Simple and Compact】 Metal shell with small size, can also be accommodated in wallet or pocket. Portable ultra-convenient! 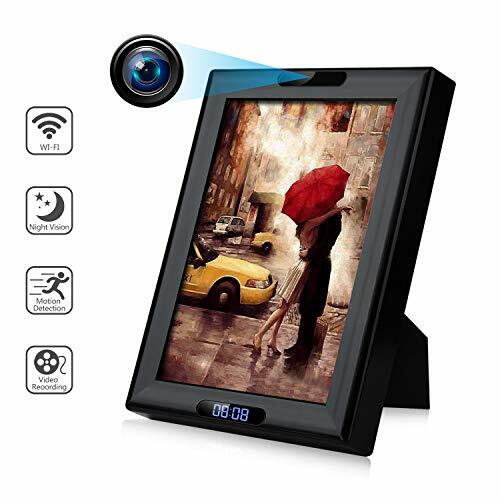 The high-quality LCD display screen design a considered frequency of use that can be easily operated with one hand and provide you easier viewing of Menu and Recording title. 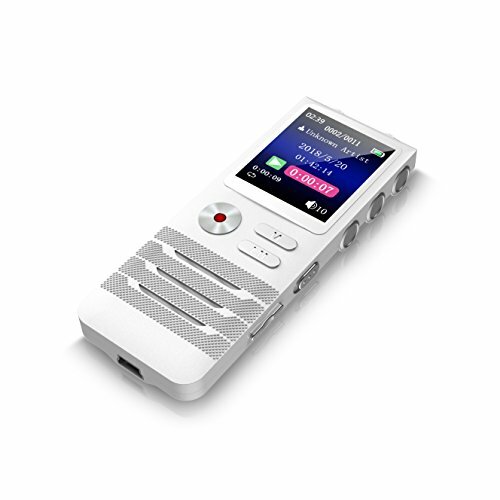 【More Than a MP3 Player】 The Dansrueus voice recorder not just help you record quality audios, you could also directly playback or listen music with this gadget! It is a nice companion, You could widely used for your semester class, lecture, speech, interview, group talking, podcast recording, ect. 1536Kbps PCM High quality recording✔--R198 voice recorder equipped with dual sensitive microphone and professional recording IC,support up to 1536Kbps PCM recording,provide a super clear recorded voice as if the speaker speaking standing by your side.FOCUS ON HIGH QUALITY RECORDING. 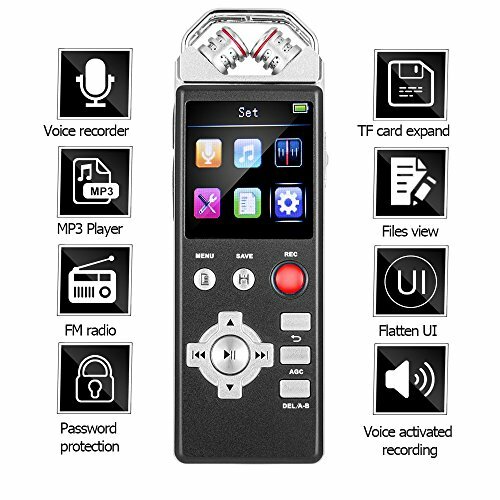 FM radio,Voice recorder,MP3 player,U-Disk 4 in1✔--Not only voice recorder and Mp3 player,but Aiworth R201 built in FM radio,Support auto tune,Up to 30 presets and FM radio recording.LOVE THE RADIO TALK SHOW?JUST RECORD IT! 【HD Sound Quality】Built-in professional intelligent audio noise reduction IC, ultra-high fidelity restore reproduction of original sound, signal-to-noise ratio ≥88DB, can support MP3, WAV, PCM recording format, up to 1536Kbps, to meet your recording in various environments demand. 【16GB Large Storage】16G memory can store 1000 hours of recording files (recorded at 32kbps) or 3000 songs. Simply upload your files to PC/MAC using a USB cable, which is very simple. 【18 Recording Hours 】Using Micro USB socket, charging for 2 hours to reach full power, continuous recording for about 18 hours, which means recording for 1 hour every 7 minutes of charging, ultra fast and safe charging. 【15M Recording Distance 】Built-in high-sensitivity long-distance dual-microphone, all-dimensional three-dimensional recording, the external environment no noise, the recording distance of up to 15m. 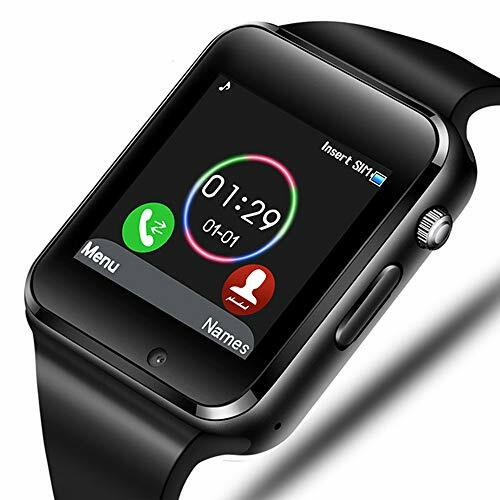 【Excellent Appearance】High-grade zinc alloy body, OLED screen, simple and stylish, beautifully packaged. Being a gift to family, friends, and colleagues is an interesting choice! 【Professional Noise Reduction & MP3 player】Superior recording quality with a bit rate of up to 1536kbps.Integrated intelligent professional audio noise reduction IC. Supports MP3, WAV recording format. 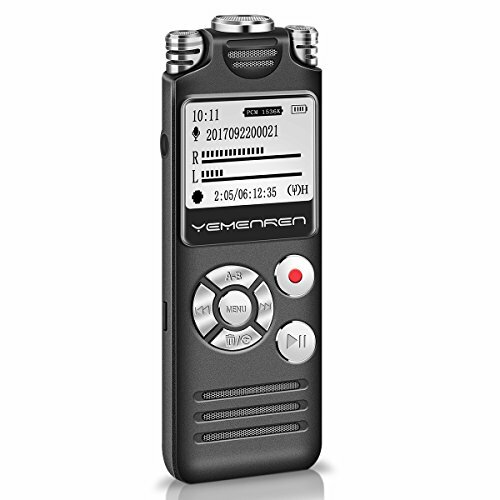 【VOR-Voice Activated Recording & Long Distance Recording】Built-in microphones, maximum 50m recording distance. Automatic voice reduction function, it starts recording when sound is detected or turn to standby state, saving recording time and reduce power consumption. 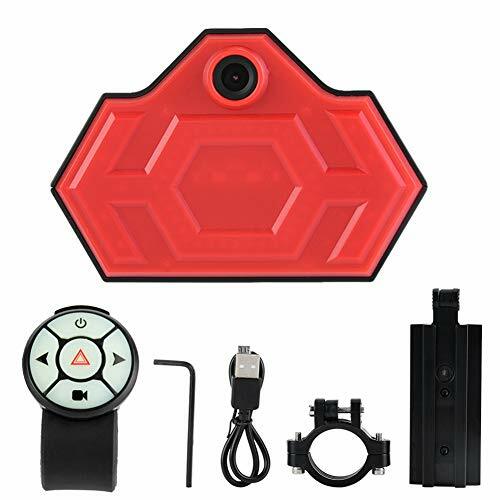 【Timer Recording & One Button Recording】Accurate time control recording, easy operation with one button REC/SAVE, suitable for beginners or elderly people. 【A-B Repeat Playback & Various Applications】Integrated intelligent professional repeat IC, important information can be re-listened. Fast forward/rewind during playback, convenient for review, lecture, meeting and so on. 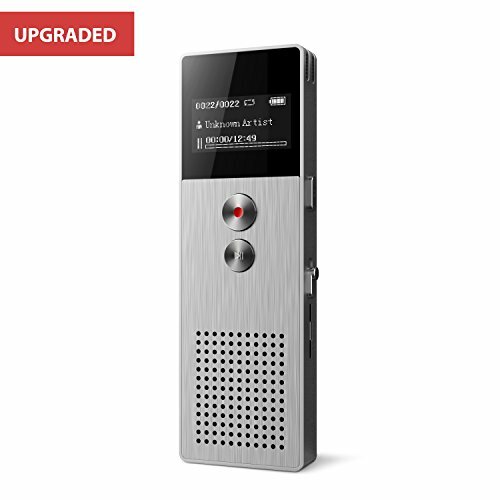 VOICE RECORDERS: With 16GB of internal memory in high-quality recording. Up to 580 Hours of recording when setting at 64/ kpbs recording quality, no need insert extra memory card. Built-in high capacity rechargeable battery, the single full charge could continuously record 13 hours. 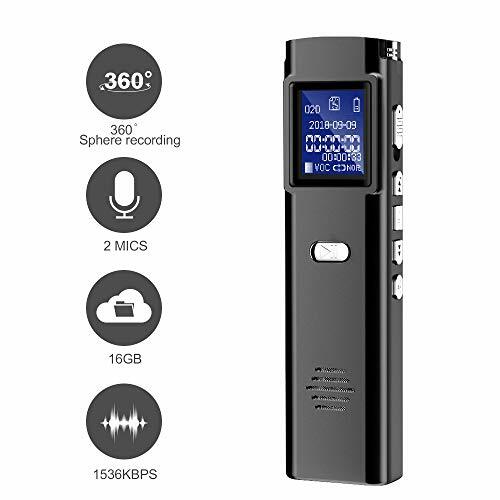 SUPERIOR RECORDING QUALITY: 2018 new design digital voice recorder, Clear recording with 1536kbps voice resolution, and two ultra-sensitive microphones with dynamic noise reduction make you enjoy crystal clear recordings, built-in loud speaker, playback easily. VOICE ACTIVATED RECORDING: Audio Recorder with voice activated setting, Set it and forget it. The recorder will automatically start recording when sound is detected and you can set it to start recording at a specified time. POWERFUL FEATURES: Easy File Management, recordings with time stamp, easy to find out when you recorded, what it recorded. 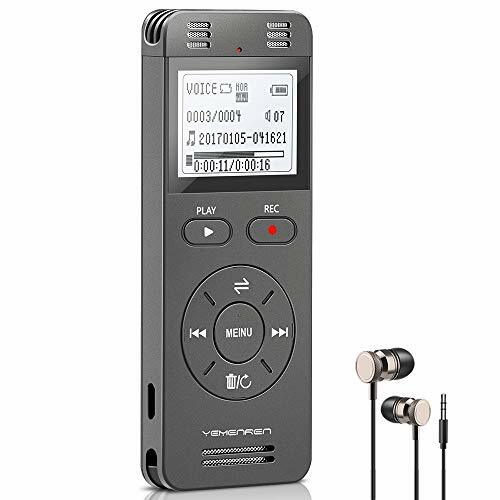 More functions like MP3 player, one button recording/ save, A-B repeat, time setting for you to record your life,work,lecture,and creative ideas. TRANSFER FILES TO MAC OR PC: Just connect the recorder to your computer using the supplied USB cable and drag the files over to your PC/MAC. We offer 1-year warranty, high quality, purchase with 100% free risk. PREMIUM RECORDING QUALITY: 1536kbps Hi-Fi Recording for the clearest recording quality. 8 levels of sensitivity for stereo microphone, allowing for clear recording up to 60 meters away. Playback/music formats available: MP3/WAV/FLAC/WMA/APE. Powerful external speaker for playback. VOICE ACTIVATED RECORDING: Avoid timely edits to your recorded audio. AVR mode allows for recording to initiate only when there is a voice or sound detected, and stops recording as soon as the sound is silenced. Automatically stitched together for convenience in one recording file. Perfect for cutting out down time in meetings or interviews, just turn it on and forget about it. NOISE REDUCTION TECHNOLOGY: Built-in AGC Noise Reduction Technology. Automatic gain module adjusts the focal length of the sound source, integrating digital signal processing (DSP) technology to remove erroneous noise and amplify the targeted sounds. PREMIUM MEMORY AND FEATURES: Record up to 36 hours of audio with built in 8GB memory, or expand the memory up to 64GB with a TF Card (Not included) for up to 290 hours of recording capability. Fast-forward, rewind and A-B Repeat functionality allows for quick playback of desired audio clips. Timed recording allows for automatic timing at specific parts of the day. UNPARALLELED CONVENIENCE: Built-in back clip allows you to attach the recorder firmly in desired position for recording, safely securing the recorder and freeing up your hands. Doubles as MP3 Player, allowing you to download your favorite music to the recorder. Premium built-in lithium battery equipped with intelligent timed shutdown ensures you'll always be ready to record. ♫ PROFESSIONAL NOISE REDUCTION & MP3 PLAYER--Superior recording quality with a bit rate of up to 1536kbps.Integrated intelligent professional audio noise reduction IC. Supports MP3, WAV recording format. 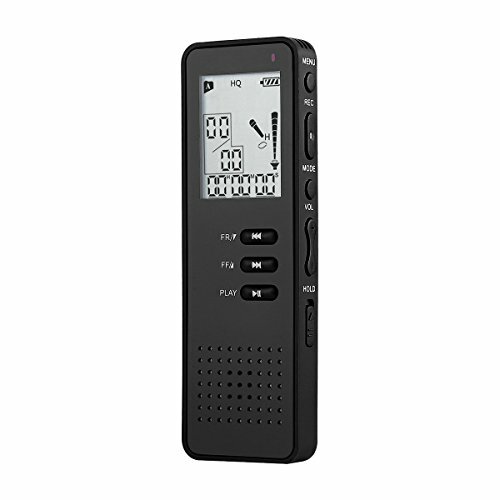 ♫ LONG-TIME CONTINOUS RECORDING & LARGE CAPACITY STORAGE--With an 8GB internal memory, AMDISI digital voice recorder lets you store up to 560 hours of recording before you need to worry about additional memory. 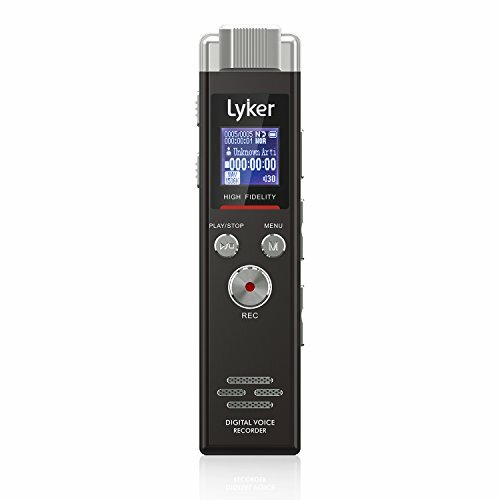 ♫ TWO ULTRA SENSITIVE MICROPHONES-- Record crystal clear audio up to 44 feet away with this audio recorder. Dual extra-sensitive mics let you record even the quietest and most discreet conversations. ♫ A-B REPEAT PLAYBACK& VARIOUS APPLICATIONS--Integrated intelligent professional repeat IC, important information can be re- listened. Fast forward/rewind during playback, convenient for review, lecture, lectures, meetings, interviews, conversations and so on. VOICE ACTIVATED RECORDING - Set it and forget it. The recorder will activate when an audible sound is present, conserving space and eliminating soundless passages. 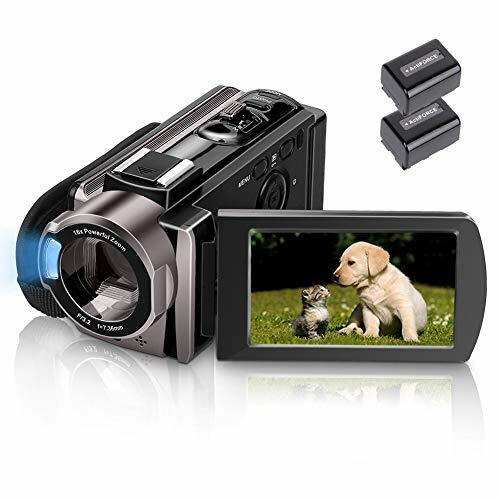 POWERFUL FEATURES - 8GB internal memory let you store up to 576 hours of recordings (record at 32kbps) or 1500 songs.Playback recordings at various rate without changing pitch, fast forward and rewind to specific spot. Quality ABS plastic case, light and ultra-portable. EASILY TRANSFER FILES TO MAC/ PC - Just connect the recorder to your computer using the supplied USB cable and drag the files over to your PC/MAC. It is really that simple! EXTRA LONG BATTERY LIFE - The rechargeable Li battery guarantees 10+ hours (about 15-18 hours) of recording on one charge, ensuring your recorder will always be ready to work when you are. A must have when phone is not allowed or may run out of battery. ONE YEAR MANUFACTURER'S WARRANTY. ✔️【RoMech BRAND QUALITY COMMITMENT】We stand behind the quality of our products. If for any reason you are not satisfied with your purchase, please contact us. We provide 45-day money back and 12-month warranty. 100% Satisfaction Guarantee for risk-free shopping! 【2 IN 1 VOICE RECORDER & 8GB U DISK】When you failed to remember all contents for classes, meetings, interviews, conversations, lectures, etc, it is high time to try AOSO Voice Recorder which is ideal for all kinds of occasions with 12 hours long-lasting recording time. Besides, when in OFF state, the device can also be as a U Disk for managing or transferring all your files. 【SUPERIOR SOUND QUALITY】Clear recording with 1536kbps voice resolution and dynamic noise reduction means you can enjoy crystal clear recordings. It is able to pickup very quiet sounds as well as standard conversation! Besides, small enough to be put into pocket or any corner. 【VOICE ACTIVATED RECORDING】With voice-activated function, AOSO Voice Recorder will start recording automatically when sound is detected while skip silent periods in your recording file. 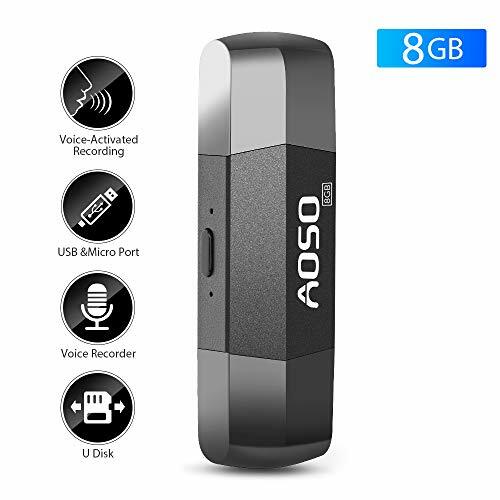 【USB & MICRO PORT】With USB and micro port for connecting a PC / Laptop / android smart phone, AOSO Sound Recorder can refresh you from messy cables. The micro port enables the voice recorder to function as external phone storage to expand your android smart phone storage. 【EXTRA LONG BATTERY LIFE】The rechargeable Li-polymer battery guarantees 12+ hours of recording on one charge, ensuring your recorder will always be ready to work when you are. We offer a FREE REPLACEMENT POLICY without any cost from your side and 1-YEAR WARRANTY. 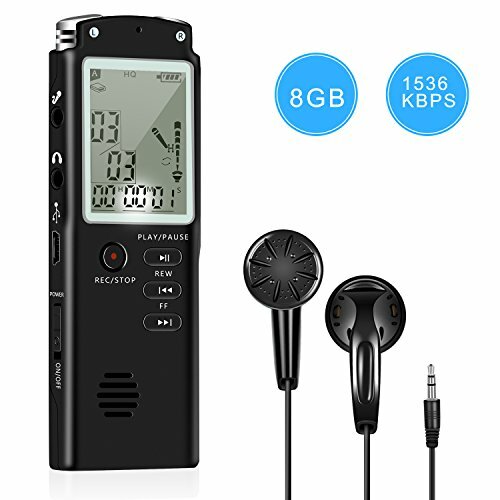 1536Kbps dual-mic PCM High quality recording✔--E36 voice recorder equipped with dual sensitive microphone and professional recording IC,support up to 1536Kbps PCM recording,provide a super clear recorded voice as if the speaker speaking standing by your side.FOCUS ON HIGH QUALITY RECORDING. High capacity in battery and memory✔--Built-in 800mAh rechargeable battery,support up to 45 hours continuous recording.16Gb flash memory could save 1160 hours recording files at most,in addition to this,E36 support up to 32GB TF card(In addition to purchase) expansion and voice activated recording.BIGGER AND BIGGER,GET A SUPER WORKING LIFE. 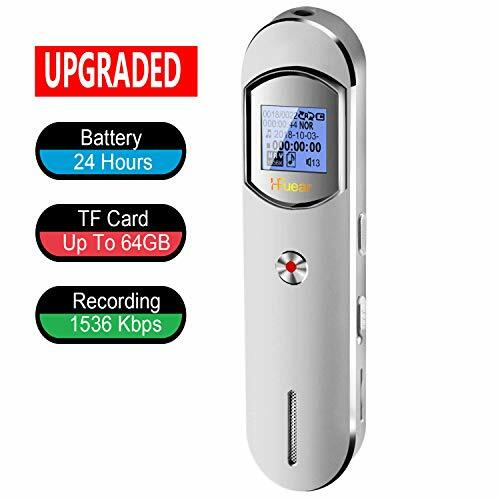 &#x1F3A4; [PREMIUM SOUND & VOICE ACTIVATED] - 2019 latest voice recorder allows high quality recording even 50ft away with built-in double sensitive microphone; Up to 1536Kbps with dynamic noise reduction, the audio voice recorder gives you crystal clear hd sound. 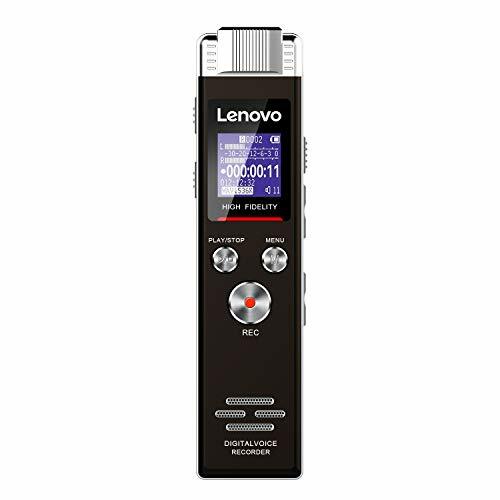 Voice activated recorder starts recording when sound detected reducing blank and whispering snippet, saving time and memory; A DIGITAL VOICE RECORDER FOR HIGH DEFINITION RECORDING, JUST FOR YOU. ✅[SIMPLEST RECORDING & FILE TRANSFER] - Quickly start recording within few seconds, Press REC/Save(center) button once, the voice recorder starts recording; Press again, the recording files are saved; Dictaphone voice recorder is universally compatible with almost any device that can recognize USB storage, files can be transferred easily to and from a Mac, PC, and Linux. SUPER USER FRIENDLY VOICE RECORDER, YOU CAN'T MISS. &#x1F495;[SAFE PASSWORD & AUTO-SAVING] -Turn on the voice recorder or files on computer through a 4-digit password lock, millions of combination gives your files and privacy a complete protection; Unique auto-saving function helps to save your files when power is low or off, you'll never worry files-lost; Easy to manage and find your voice recording files as they're in date/time format. NO WORRIES OF FILE LOST OR LEAK ANY MORE. &#x1F4AF;[ENORMOUS CAPACITY & QUICK CHARGE] - 8GB enormous memory voice recorder can hold up to 580 Hours of recording at 32 kpbs, or 1500 songs ; Support up to 64GB TF card (Micro sd card) extended memory; After 2 hours quick charge with computer or adapter via USB, built in rechargeable Li-polymer battery can support high quality (at 1536kbs) continuous recording for around 20 hours. SUPER LARGE MEMORY & BATTERY, BEYOND YOUR IMAGINATION. ※DUAL-CORE PROCESSOR NOISE REDUCTION: Using professional DSP acoustic processor,built-in intelligent noise reduction chip,directly filter the surrounding noise,abilitiy to capture recording content accurately and clearly. ※THREE ULTRA-SENSITIVE MICROPHONES: Great voice recorder for lectures,conferences,interviews,classes,conversations and concerts with ultra-sensitive microphones.The maximum sound sampling rate is 1536Kbps and supports recording distances up to 50 meters. ※VOICE-ACTIVATED RECORDING: The recording can be activated by sound,the silent segment can be omitted to save the storage space.You can use the earphone to listen to your sound while recording,the recorder function simultaneously as a hearing aid. ※POWERFUL AND EASY TO OPERATE: Our digital recorder supports both MP3 and WAV format file which can be easily transferred to MAC or PC;recording files saved with time stamp;one switch to record,save and delete.Audio recorder has metal solid case,lightweight and it is portable. ※EXCELLENT AFTER-SALES SERVICE:SAIMPU provides lifetime warranty with professional customer service support. (Service card comes with your package.) (WARNING: Does not fit for recording with external microphone). ★【16GB INTERNAL MEMORY & LONG RECORDING TIME】━━ 16GB Digital voice recorder mac compatible, save 5000 songs or 1000 hrs recorded files. It can be widely used for your class, lecture, speech, interview, meetings, design ideas,podcast recording, ideal for students, professor, teacher, businessman, writer, blogger, anyone who loves to record frequently in your life! ★【SUPERIOR RECORDING QUALITY】━━ Clear recording with 1536kbps voice resolution, the ultra-sensitive microphones with dynamic noise reduction means you can enjoy crystal clear recordings.meanwhile external speakers play HD sound recorded and music loudly and clearly! 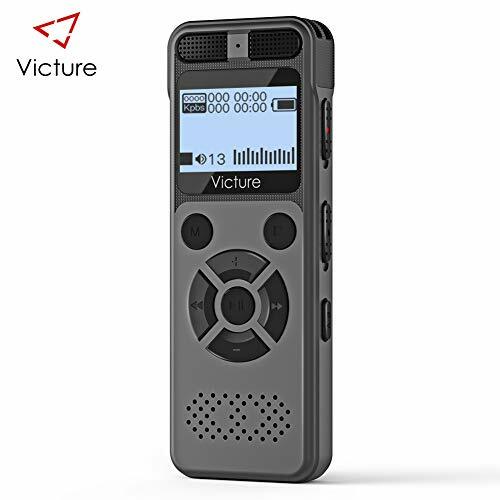 ★【VOICE ACTIVATED RECORDER】━━ The recorder will automatically start recording when sound is detected,No voice no record, save your time and memory space. also you can set it to start recording at a specified time! ★【POWER-ON PASSWORD PROTECTION】━━ Turn on the voice recorder through a 4-digit password lock setting,no one can turn on the device or to steal your private information.if three trial was error,device will auto turn off.help you protect your intellectual property easily and safely. 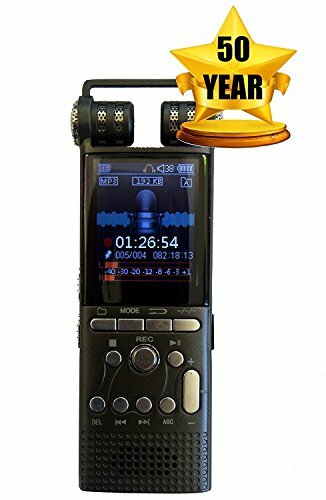 ★【100% SATISFACTION GUARANTEE】━━ Compact and portable size with premium metal shell , LCD screen and well operated buttons,the unit weight only 62g make this digital sound recorder easier for you.1-YEARS WARRANTY. If you ever have any issue with this recorder, we will provide a full replacement or refund! Zero risk purchase! 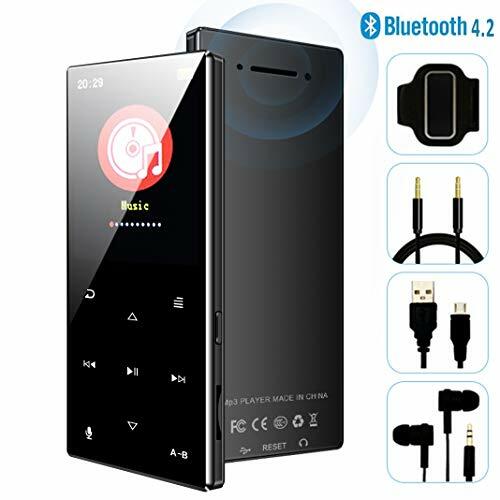 BUILT-IN MP3 PLAYER: A professional MP3 player able to switch between musical tracks, A-B repeat, fast forward and rewind, as well as fast/slow playback. Built-in two channel stereo speakers guarantee brilliant transparent musical sound. 1.4 inch LCD screen and black fine plastic body made the voice recorder high class looking. Enormous Memory &Long Working Hours✔：Built in 16G of memory ,which could save 1200 hours recording files or 3000 songs at most.Beyond that,it support up to 64GB SD card expansion.The upgraded imported sound recording chip can record continuously for up to 50 hours with full charge.DESIGNED FOR LONG RECORDING AND LARGE MEMORY STORAGE. Powerful features✔: 5V-1000mA charger for fast and secure transmission.99.5*32.5*13mm portable design ,put it in your pocket and listen to music to relax after meetings and study.Silky appearance and excellent abrasion resistance with one year warranty.Be free to ask us for ebook and video tutorial.Best gift for students,interviewers. ⭐【SUPERIOR RECORDING QUALITY】- Clear Recording with no noise! 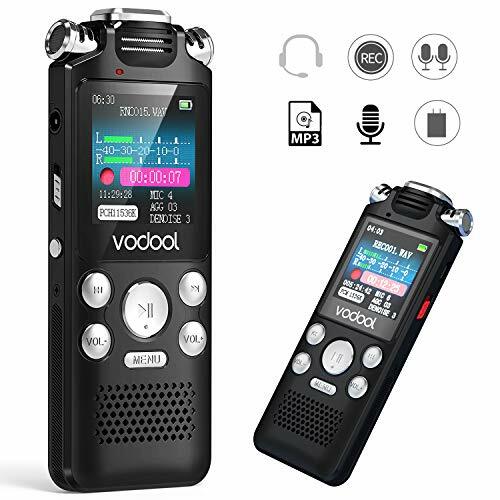 Vodool digital voice recorder built-in triple ultra-sensitive stereo microphones with 1536Kbps voice resolution and intelligent DSP noise reduction cover with 360° sphere recording, save files with WAV/MP3 format, bring you a crystal clear recordings even while you're up to 40ft away. ⭐【TIMER RECORDING】- Set it and forget it！Is it boring to repeat setting the recorder every time？With our Dictaphone, it will not happen again. Timer recording features helps you to record the important moment according to the time you set, with the cycle function - once, daily or working days allows it to initiate automatically at a specified time, the best backup assistant for class, lecture, speech, interview. ⭐【BUILT-IN MP3 PLAYER】- Not only a recorder, but also a professional MP3 music player. Our light weight pocket size digital recorder allows you to switch your recording or music between musical tracks, A-B repeat, fast forward and rewind during playback. ⭐【SIMPLE OPERATION】- One key to record, easy to use! Just push the key to start your recording, no need extra operation. Easily transfer files to MAC/PC by using the supplied USB cable. 1.44 inch color LCD screen provides you easier viewing of Menu and the exquisite metal casting body make the voice recorder high looking. TOP QUALITY: Each Voice Recorder is made with the best materials for extended durability. A rechargeable battery, so you enjoy long-lasting recordings, an 8 GB internal memory for storage and a fantastic AUTOSAVE feature when you are low on power or when recorder goes off. AUTOMATICALLY SAVE WHEN POWER OFF: When the battery is low, the system will automatically saves the recording files and power off, make sure the files in safe status. It can also record while charging. You'll love it. CRYSTAL CLEAR RECORDING: This Sound Portable Recorder boasts a sophisticated all directional mic records the best quality sound. With our unique automatic acoustic noise reduction feature and a 1536kbps voice resolution, enjoy crystal clear recordings whenever you use this recorder. 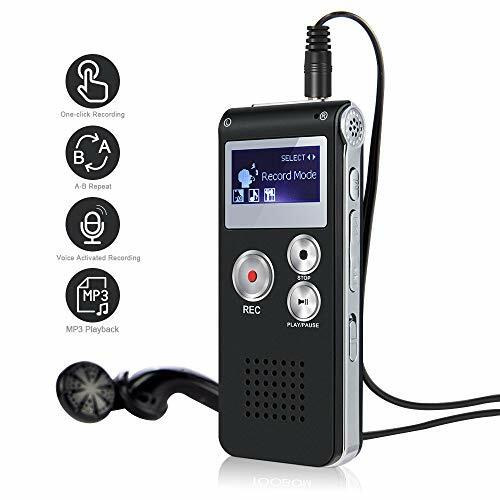 AWESOME MULTI-FEATURES: With a 360° surround sound, A-B repeat, easy file searching, instant playback and timing recording, our Activated Dictaphone is just what you need for hassle-free recording. Perfect for lectures, interviews, meetings or conversations. 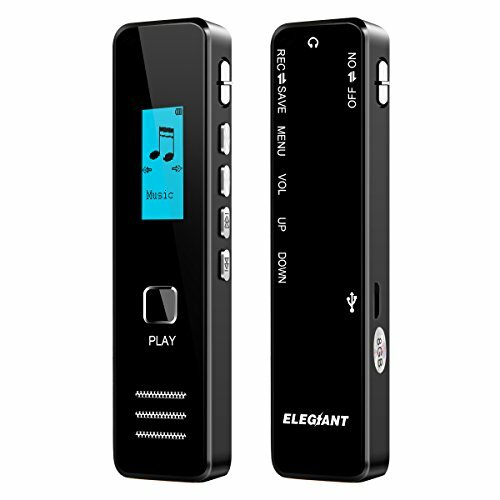 BUILT IN MP3 PLAYBACK: Listen to high quality audio recordings with this Digital Sound Recorder. Easily choose between tracks, fast forward and rewind with a simple click. You will love our fast and slow playback speeds that allow you to hear every one of your recordings. 【3 in 1 Function】: Digital recorders, MP3 players, and USB flash drives. 【8GB of Internal Memory】: It can store up to 650 hours of recordings without the need for additional memory cards. Use as 8GB Flash Drive or USB Voice Recorder to store all your music, data. Also, it can connect to the PC quickly through the USB cable. Upload and download files without U disk driver. 【Superior Recordng Quality】: Clear recording with 1536Kbps voice resolution, and two ultra sensitive microphones with dynamic noise reduction means you can enjoy crystal clear recordings even while you're up to 196 ft away or to record quiet, discreet conversations. 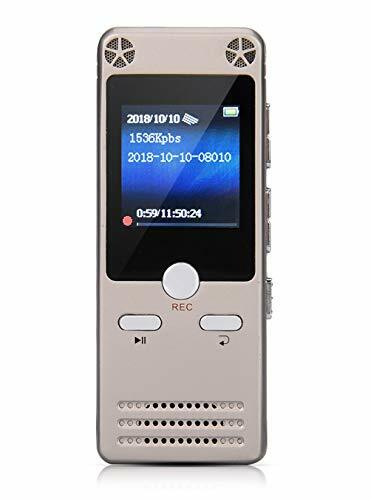 【Exquisite Appearance】: Each digital recorder is small and lightweight, so it can be put into your pocket, package or briefcase, and take various recording interviews, conferences, lectures and other audio conversations! 【Wide Compatibility】: It support WAV MP3 recording, compatible with MP3, WAV, WMA, APE, FLAC, music playing and long-time recording. Telephone recording function allows you to record detailed conversations. RECORDS ANY CELLPHONE OR LANDLINE CALL - Use our included proprietary Microphone Inside Earbud accessory which takes only 10 seconds to set up. Insert this into your ear and then hold your phone to that same ear like you normally would to talk. Press Record to start, and Stop when done. Easy! HQ AUDIO AT 1536KBPS - With the absolute highest KBPS available on the market, you will be blown away by the quality of .WAV sound. If MP3 format is preferred, you can record at 192KBPS. ENORMOUS 16GB CAPACITY - Holds hundreds of hours of recording, and can expand up to an additional 16GB via any MicroSD card for a total of 32GB.